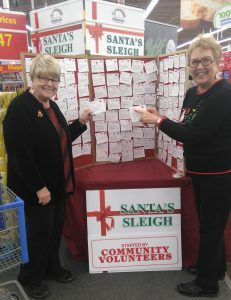 The Santa’s Sleigh Christmas Giving Program is the annual KHCF fund raising event held at the Peterborough Walmart Store on Chemong Road that helps make Christmas brighter for local children and youth. 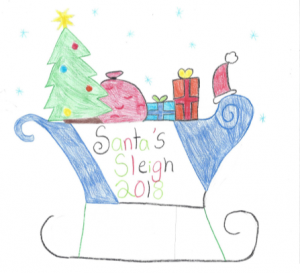 Through our Santa’s Sleigh Christmas gift-giving program each child receiving services from the Kawartha-Haliburton Children’s Aid Society receives gifts of their choice purchased and donated by members of the community. 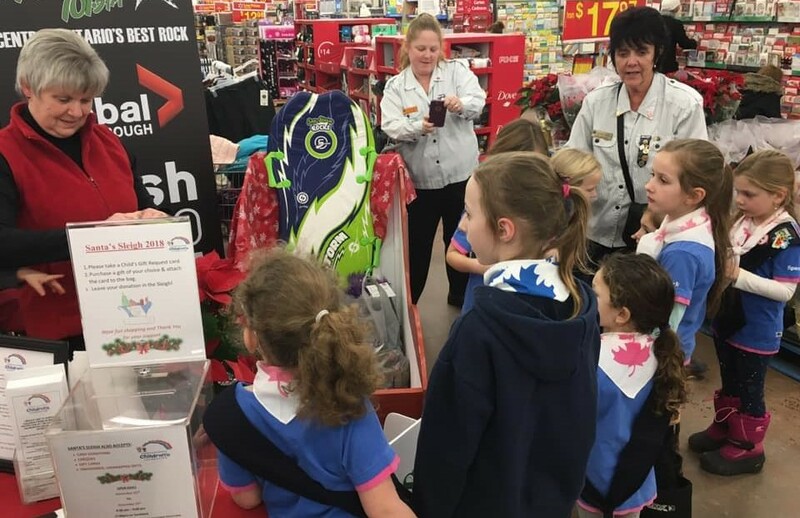 Walmart shoppers choose a card from the Sleigh board, purchase the requested gift and drop it off in the Sleigh. Gifts are then collected by Foundation staff, sorted and delivered to the KHCAS case workers, who in turn happily present them to each child before Christmas. 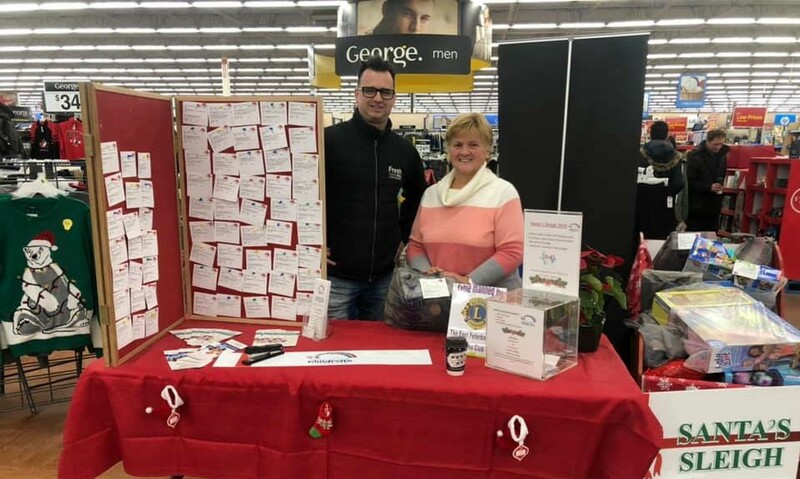 Each year upwards of 150 local volunteers from the Peterborough and Kawarthas Association of Realtors®, the East Peterborough Lions Club as well as a number of generous, community-minded individuals give their time to mind the Sleigh at Walmart on Chemong Road. 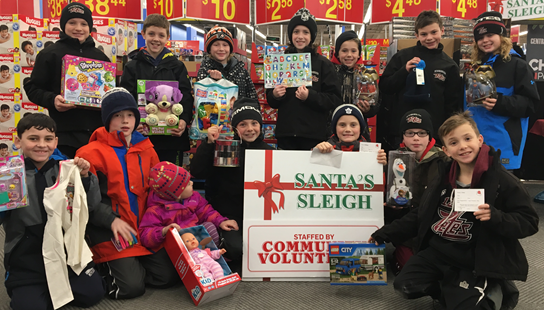 Over the last twenty-eight years our community has given over 20,000 gifts to children through the Santa’s Sleigh gift-giving program. Also through the Santa’s Sleigh Christmas giving program, many local businesses and organizations sponsor entire families in need. This Christmas fund raising program also collects donations of much-needed gift cards and personal care items in support of youth who are in transition from KHCAS care and working at their developing independence. This year Peterborough and area have absolutely outdone themselves. For the second year in a row, every name was taken off the give-a-gift board. That’s a total of 1018 children who received gifts. That’s not all, we were able to sponsor 21 families, and 60 youth living independently. We would like to thank all 2370 individual and business donors who participated this year. You have shown that Christmas is still alive in your hearts and minds. We would also like to thank Walmart on Chemong for allowing us to park our sleigh in their entrance way again. We look forward to carrying on this annual Christmas toy-drive that has become a tradition in our community. None of this would be possible if it was not for our generous corporate sponsors, donors or volunteers. We apologize in advance if we missed anyone. Thank you to the space donated by Chemong Walmart Canada, support from our media partners The Wolf 101.5 FM, CHEX News and 1005 Fresh Radio, CP24 CHUM Christmas WISH, Peterborough Examiner, and snapd Peterborough, and the volunteer support from Peterborough and the Kawarthas Association of Realtors Inc.. the East Peterborough Lions Club of A-3, Nancy McIntyre, Foundation Board Members, Kawartha Haliburton Children’s Aid Society employees and their families, and other dedicated volunteers. 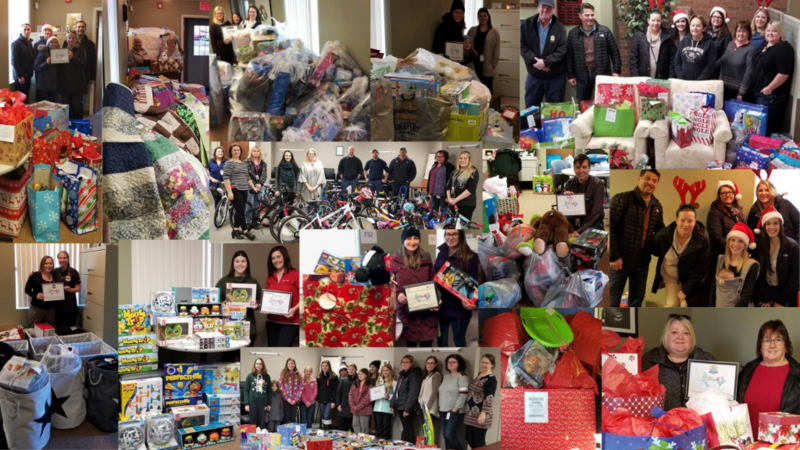 We would especially like to thank all those business, organizations and schools who donated toys, food and cleaning supplies in hampers, gift cards and clothing, and to those sponsored large numbers of children and families this year: FedEx Ship Centre, Shorelines Casino Peterborough, the Millbrook Needlers, Fleming College (Human Resources and Trades and Technology), Monsignor O’Donaghue Catholic School, General Electric Peterborough, Peterborough Utilities Group, the Ontario Waterpower Association, LCBO (Kinmount, Haliburton, Wilberforce, Gooderham and Minden), Peterborough Novice A Petes, The Ennismore Knitting Club, Doughty Masonry Center, Peterborough Subaru, Gordon Usher, Larry Love and James Jordan Law Office, SOCKS Peterborough, the City of Kawartha Lakes Court Services, SCF Solid Countertop Fabricators, Kawartha Ontario XV Blue Knights, Gillian Taylor and Castle Antiques Haliburton, Pepsico Foods Canada – Quaker Oats Plant, St. James United Church, Al and Trish Parro, Nurse Scrap Metal Inc., Otonabee Conservation, Savage Arms Canada, Trent University (Financial Services and Facilities Management), Waste Connections of Canada, Omemee Lioness club, HLM Developments (Castlewood Place), Frost Whetter Oaklin Insurance Brokers – Peterborough, Compass Early Learning and Care – St. Martin’s Before and After school JK/SK program, Peterborough Optometric, Smallchangeptbo, PTBO Needs, CAA South Central Ontario, and all the wonderful individuals who sponsored families. Lets make next year even better.